According to the adverts Double Diamond works wonders. 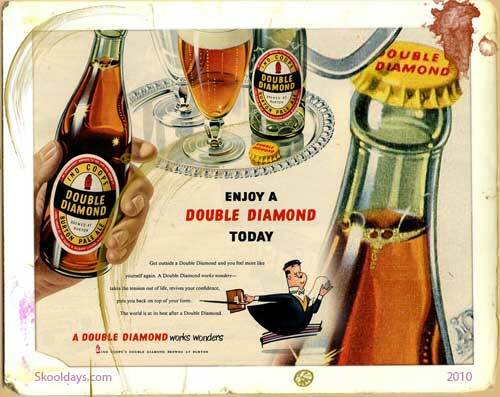 Sadly Double Diamond is a Beer of the past. It was massive in the sixties and seventies and most soccer footage show one advert at the football stadium advertising the Ind Coope Beer. Until the 1960’s beer had been regional.Then in the sixties national names emerged, namely Double Diamond, Mackeson Stout and draught and bottled Watneys Red Barrel. Double Diamond, Bass Worthington and most notably Guinness, were becoming increasingly available as draught. The success of Guinness encouraged Watneys to compete with Colonel Murphy’s Stout. Double Diamond approached television as a crucial mechanism for getting their voice heard by a wide audience. The jingle: “A Double Diamond works wonders, works wonders, works wonders. A Double Diamond works wonders, so drink some today!” was used throughout the seventies campaign. In recent years imported beer became popular and eventually Double Diamond or DD disappeared all together into the archives of history. Double Diamond Burton Ale, a brand of beer brewed by Tetley’s Bitter. Carlsberg UK still sells a Burton Ale seasonally in its Draught Cask series but under the Ind Coope brand, not as Double Diamond.